The Hunchback of Notre Dame (French: Notre-Dame de Paris, "Our Lady of Paris") is a 1831 French novel written by Victor Hugo. It is set in 1482 in Paris, in and around the cathedral of Notre Dame de Paris. The story is about a poor Gypsy girl (Esmeralda) and a bell-ringer (Quasimodo) who was raised by the archdeacon (Claude Frollo). 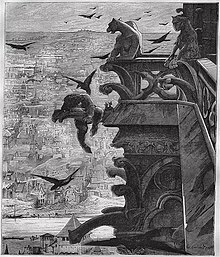 Wikimedia Commons has media related to Notre-Dame de Paris (Victor Hugo). This page was last changed on 12 August 2018, at 21:24.